We’d love your help. Let us know what’s wrong with this preview of Our Lady of the Streets by Tom Pollock. Streets are wracked by convulsions as muscles of wire and pipe go into spasm, bunching the city into a crippled new geography; pavements flare to thousand-degree fevers, incinerating anyone and anything touching them. Tower Four months ago, Mater Viae, the Goddess of London, returned from London-Under- Glass to reclaim her throne. And ever since then, London has been dying. To ask other readers questions about Our Lady of the Streets, please sign up. I'm so glad I got around to reading the last volume of this trilogy after having read the first two as they came out. What an amazing climax to a brilliant trilogy! It's difficult to talk about the third volume in a series without spoiling the first two. I will attempt to do so no further than the blurb already spoils them. After the events of the first two books in the series our London is much changed. The Mater Viae from London-Under-Glass has entered our world and devastated it magically. The I'm so glad I got around to reading the last volume of this trilogy after having read the first two as they came out. What an amazing climax to a brilliant trilogy! After the events of the first two books in the series our London is much changed. The Mater Viae from London-Under-Glass has entered our world and devastated it magically. The remaining population who haven't evacuated are partially being protected by the very-changed Beth and the newly-returned Pen who together lead a resistance of Lampies, Pavement Priests, Gutterglass, Oscar the Sewermander and some surviving humans. But they're up against the power of a Goddess and they'll need more than that to survive, let alone win, and the allies that they will need to seek are far from their first choices. The hidden London of The City's Son and London-Under-Glass of The Glass Republic were beautifully realized and peopled with fascinating creatures and engaging characters. The London of the Mirror Mater feels like a new world again with fever streets, blind streets, tideways and the horrific claylings all adding an atmosphere of looming disaster. Another strength of the writing of the first two books continues in force here with some absolutely cracking action sequences that don't neglect the depth of these characters or the sacrifices they need to make. This was a fantastic ending to what turned out to be a really fun enjoyable series. I think this is my favorite of the 3 but it's just a great series as a whole. IMPORTANT: This is a review copy from Jo Fletcher Books and would normally go live on The Founding Fields. However, seeing as the backend of TFF is currently down, all book reviews will be posted on The Fictional Hangout for the foreseeable future. When the problem with TFF is eventually fixed, they will be reposted on The Founding Fields. Apologies for any inconveniences. It’s been four months since Mater Viae passed through from London-Under-Glass and claimed her throne. In those four months, the city has sickened and its occupants divided. London is on the brink of a civil war like no other. If you’ve not experienced Tom Pollock’s London yet, go and get yourself a copy of The City’s Son right this minute. The third book does not disappoint at all and I can’t remember the last time a trilogy has delivered so well in every single book. From the opening pages, the s It’s been four months since Mater Viae passed through from London-Under-Glass and claimed her throne. In those four months, the city has sickened and its occupants divided. London is on the brink of a civil war like no other. From the opening pages, the streets are closing in, literally as windows and doors are disappearing, leaving nothing but brickwork and the fading screams of those trapped inside. The outlook seems bleak for both the city and Beth, who now must feed off sickly streets. Loyalties are divided and refugees are camping out in Selfridges, one of the last safe havens from a city that is slowly consuming itself. Tom’s characters don’t come out of their adventures unscathed. It’s not just their inner selves that are transformed, but when bad things happen in this world, they also have physical impact. Pen still holds her scars from the Wire Mistress (who you can expect to see more from in this book) and has another chance to address her internal scars. Beth’s transformation is more fantastical, but comes with many new challenges. And there’s loss. Not just of the city they call home, the streets lost to a malignance, but also to those they hold dear. Beth visits the baby Pavement Priest that is all that is physically left of Fil and she carries his stolen memories in a flask. Pen learns how her parents, who no longer remember her, think they are going insane. This is a world of tough decisions, unknowns and living with the consequences. There’s a nod to some of the creatures from the past, some who side with them and others that see the Mirror Mater as their true Goddess. Alliances are shifting, and not always in the direction that you expect. It feels a much more familiar world by now, less of a learning curve getting to know Tom’s stunning world-building. The ending is dramatic and emotional. I was so thrown by one bit with the cats, where I was thinking aww, isn’t that lovely, only for the scene to pan out and be something else. It really manages to play with your heartstrings if you’ve come to love this world and the characters. such a different and unique story. loved it! This series is the story of two best friends who take on an urban goddess. Beth and Pen have gone through so much since we met them, but the hardest part of their journey is yet to come. Beth has transitioned from having a human body to one made of concrete, crisscrossed with London's streets, The concluding volume of The Skyscraper Throne series will not disappoint fans! Our Lady of the Streets brings Beth and Pen together to take on the Mirror-Goddess and save London from an unimaginable fate. Let me just talk about Pen here. Unsurprisingly, I identified with Pen more than Beth: I don't get to see many girls who look like in fiction, and even fewer who share my faith. And Pen is this amazing, gorgeous, vibrant, hijab-wearing Pakistani girl who attends salat (prayer) when she can. She's my hero! The presence that the secondary characters have in this novel is extraordinary because a great number of them are physically not even around! Filius Viae is a baby trapped inside the body of a Pavement Priest, Espel is still behind the mirrors, and Pen's parents don't remember her any more (and think they're insane because her aunt still remembers her). And yet they are all so very present in Beth and Pen's thoughts and memories, which was awesome. The other secondary characters are also great - including Gutterglass, who is still following Beth, and the Pavement Priests, who don't really know whether to serve Beth or the Mirror Goddess. There is uncertainty in every facet of life in London now, and even long-standing allies can switch sides when pressed. I guess I've always wondered what's happening to the 'normal' people while this (literal) underground war has gone on, and we see this vividly in Our Lady of the Streets. Pen and Beth scramble to protect and save as many of London's inhabitants as they can from the Fever Streets that melt everything and the Blank Streets that trap people inside the buildings. The entire city is sick and Beth, who feeds from the streets, slowly poisons herself. I've developed an emotional attachment to the word and its characters, so everything that happened seemed extra emotional to me. I raced through the book and even though I knew this journey wasn't going to be easy, I was taken aback by the things that Pen and Beth had to do, the extent to which they were willing to go. On a side-note, I was unexpectedly moved by the roles that Johnny Naphtha and the Chemical Synod played in the novel. I think they're the best element in the series, and I've always loved them, so it was especially emotional! I didn't want Our Lady of the Streets to end, even as I wanted the torment to stop. I'm going to miss Pollock's London and his nuanced, vivid characters. I'll comfort myself with the thought that he'll hopefully be giving us new adventures to swoon over in the future! This is a superb series (read all three this week back to back) and The Lady of the Streets provides the perfect conclusion - as thrilling and powerful and imaginative as the previous two and with a thoroughly satisfying ending. Do read this trilogy! This final instalment of the trilogy neatly brings Beth and Pen's adventures to a close, however it wasn't quite the ending that I was hoping for the series. The best thing about this novel, as with the previous two instalments, is its setting. Pollock's world-building is breathtaking and intensely satisfying. It's one of those concepts that you wish that you'd thought up for yourself; the presentation of London as an organic whole. With the return of Mater Viae, this becomes clearer than ever. T This final instalment of the trilogy neatly brings Beth and Pen's adventures to a close, however it wasn't quite the ending that I was hoping for the series. The best thing about this novel, as with the previous two instalments, is its setting. Pollock's world-building is breathtaking and intensely satisfying. It's one of those concepts that you wish that you'd thought up for yourself; the presentation of London as an organic whole. With the return of Mater Viae, this becomes clearer than ever. The streets burn with fever and the cruel mirror queen rules from her throne atop Canary Wharf. Even Beth has now become a microcosm of herself, her body gradually taking on the shape and sounds of a city-made-flesh. It is beautiful and wonderfully original. However, the story itself felt weaker than previous instalments. Although the first half of the novel draws together all of the survivors (including a couple of returns for ones that you might not expect), it took far too long to do so. While the pacing of previous instalments was rather steady, this one felt bottom heavy. Very little actually happens in the first two hundred pages other than a lot of talking and strategizing. However, it is the second half of the story where things come alive. As Beth and Pen mobilise their army and assault Mater Viae, the story becomes an utter thrill ride. The final battle is more dramatic than I ever could have imagined, and I found that I could not put the book down. Yet, I do think that the climax has the capacity to divide readers. Beth's final battle against the crazed Goddess is very surreal, and it took me a little to suss out exactly what transpired. While I do actually really like this ending, it was a little bittersweet as the salvation of the city came at an incredible cost. Disappointingly, however, the characterisation in this novel was a bit varied. Beth does not get anywhere near as much character growth as she deserves. While she has come a long way from the troublemaker that she was at the beginning of The City's Son, she still does not seem to have changed that much over the previous two books. Even when she experiences great personal loss, it does not seem to affect her as much as you would expect. Yet Pen's development was a lot more enthralling. While I was disappointed that her relationship with Espel was largely pushed to the background, she did go from strength to strength. I loved that Pollock gave her the chance to confront the demons of her past and come out stronger, but the most powerful moment for me was the brief scene that she shared with an elderly woman in a ruined supermarket. Pen has really flowered over the course of these books, growing from a shy and introverted character to a warrior. Last year I started reading The Skyscraper Throne of Tom Pollock with the first book in the series The City's Son. Being a long time fan of Urban Fantasy I intimidatingly liked the premise of the series. What I like to see in every Urban Fantasy is a unique concept, there are many tropes that have become standard in this genre and that frankly are quite boring to read about. With his first book and series Tom Pollock showed that he didn't fall in this category, he showed a lot of creativity in imagining his world and how he interprets Urban Fantasy. The storyline went from action packed in the first book to an emotional rollercoaster in the second book, with transforming his story in this way it was nigh on impossible to think about what would be in store for the conclusion but that it would be one grand finale. And it is! A lot of things have already transpired in the first two books. Here is brief recapture. The first book focused on Beth and Filius Viae, they met up with a freak accident and felt oddly drawn to each other. Beth a rebellious teenager and Filius the son of a Godess, together they marched against the God of Cranes, they won but somethings were lost as well... The second book in the series introduced us to Pen Parva and the magnificent city of London-Under-Glass, the mirror image of our own London. This alone will leave you agape, but the story that Tom Pollock writes around this mirror image of London is very powerful and readily transformed the whole premise of the series. It will make you look different towards a lot of things, this mirrorstocracy that was introduced was on many fronts beautiful but also sinister and very dark. The first thing that fall to note when you start reading Our Lady of the Street is the self assurance with which Tom Pollock writes his conclusion. He has delivered two already stunning books but when you compare The City's Son with Our Lady of the Streets you can clearly see that this last book is written with a lot more confidence, Tom Pollock is definitely in control. 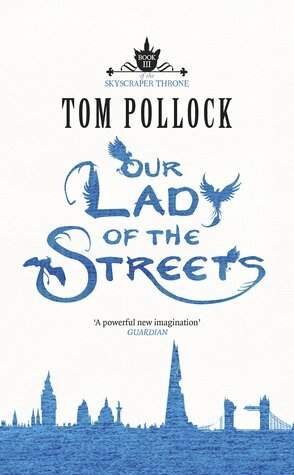 I was a fan from the first book but with Our Lady of the Streets and reflecting on the whole series as well, Tom Pollock hasn't only let his story continue to grow but also let him as an author grow. From the first pages you feel the book is already gearing up to many unavoidable confrontations between several mighty players that we have gotten to learn about in the first two books. It's really cool stuff and there aren't and expanses saved in letting everything go down the way it does. I am very impressed with the story that Tom Pollock once again has put unto paper. The first two books put a smile on my face but Our Lady of the Streets does it twice over and I am still recalling every scene in the book, there are some pretty great displays of the strength that is inhabited in many of the different powers of the city. Furthermore what really suprised me was the ending of the story. You all hope that everything turns out for the better for everyone, well it doesn't. This isn't a all ends well kind of story. Giving this reality that some people just can't be saved creates a very emotional, powerful and beautiful ending, that I think no one had dared to dream about. One thing that I do have to keep stressing with Tom Pollock's books is the world building. It really is one-of-a-kind. Of course we have seen gods in Urban Fantasy before but nothing in the way that Tom Pollock interprets this trope. Gods that inhabit machine or that are embodied in the Thames for example and lets not forget Mater Viae herself. The descriptions that are used in showing just what the world of The Skyscraper Throne is about paints a very beautiful and vivid picture but you are also reminded that not everything shines as brilliant, there is also a very dark tone to the story that comes to the front mainly in the weird creatures that inhabit the streets of London. Like the Blankeits, Railwraits, Bahngeists, The Chemical Synods, Pavement Priests and Sodiumites and many many more. But do not automatically that everyone is against Beth and Pen, they have alleys amongst these as well. I am a big fan of these creatures that Tom Pollock has created, they really add a great view upon his world. They aren't names to name a creature but in describing them they live and breath the urban London surrounding, Pavement Priests "melt" into the pavements and move about Blankeits live in the city's lights and Bahngheits are trains that walk. This also counts for the transformations of Pen and Beth. They are no longer human and in stead of using the human references, Beth is described as part of the city with her concrete skin, leaking oil and many more references, this really inspires a very cool setting to the story. Looking back, I think this was my favorite of the three books in the series because the city is at its most fantastical. We finally see the two best friends back together again and their friendship is as strong as ever even though they've both grown up so much. And I adore this series for that. Both the first book and the second introduce romantic partners to the two girls, but it never takes the place of their friendship with each other. We really need more books that do this because the prevai Looking back, I think this was my favorite of the three books in the series because the city is at its most fantastical. We finally see the two best friends back together again and their friendship is as strong as ever even though they've both grown up so much. And I adore this series for that. Both the first book and the second introduce romantic partners to the two girls, but it never takes the place of their friendship with each other. We really need more books that do this because the prevailing message that our partners in life will somehow fill all our needs is just so wrong. It puts way too much pressure on SO and de-values friendships that keep us sane and more open to new things. All good things must come to an end, so it was inevitable that Tom Pollock’s debut series would end too. After the fantastic The City’s Son and the equally wonderful The Glass Republic , this final instalment in the trilogy Our Lady of the Streets came with high expectations and had to meet a high standard to equal its predecessors. Happily, Our Lady of the Streets is even better than the previous books. It takes Beth, Pen, and all their allies on a wild ride trying to save the city they love All good things must come to an end, so it was inevitable that Tom Pollock’s debut series would end too. After the fantastic The City’s Son and the equally wonderful The Glass Republic , this final instalment in the trilogy Our Lady of the Streets came with high expectations and had to meet a high standard to equal its predecessors. Happily, Our Lady of the Streets is even better than the previous books. It takes Beth, Pen, and all their allies on a wild ride trying to save the city they love and their own lives in the process. Since this is book three in a series it’s hard to review it without giving any spoilers for the previous books. I’m keeping them to a minimum, but you have been warned. Where the previous books were mostly about Beth and Pen separately, Our Lady of the Streets is definitely their story together. I loved the interplay between Beth and Pen in The City’s Son and always felt somehow cheated we didn’t get more of it. In this book Pollock gives it to the reader in spades. Their friendship is really the heart of the series. In fact, I’d argue this series is about their friendship more than anything. I love that in Beth and Pen we have two best friends who are there for each other through everything and even if they argue, they find their way back to each other. There is not cattiness, no bitchiness, and no going after the other’s romantic prospects. It’s rare to find this sort of friendship between girls in books and I wish we’d get more of them. With the return of the Mirror Mater to London, Beth needs to step up and lead. London is under siege and only Beth will be able to stop Mater Viae from taking power. To do this she needs to learn what exactly her transformation means and what powers, if any, come with it. Pollock not only gives Beth new strengths, he also adds new weaknesses and shows just how painful being a leader in what is essentially war time is. He shows how hard Beth takes her losses and how much she just wants to protect her loved ones by keeping them out of the line of fire. Yet in the end, Beth learns you can’t control people’s choices and they have the right to choose to be part of the fight. In Our Lady of the Streets Beth becomes somewhat of a tragic hero, albeit in true Beth Bradley-style, with the expected amount of snark and humour. There are also clear echoes to The City’s Son in the book, sometimes mirroring the events and in some cases using it as a contrast. It’s an elegant use of foreshadowing and one that is entirely fitting, yet unexpected. Pen meanwhile is back down the rabbit hole and trying to survive and reconnect with Espel. While it would have been easy for Pen to have slipped into just a sidekick role to Beth, she because anything but. Her choices are her own and she has to make some hard decisions. From the previous books we knew Pen was brave, but just how courageous she is, becomes clear from the choices she makes and the allies she manages to recruit to their cause at great personal cost. I loved Pen’s arc in this novel, perhaps even more than Beth’s. Pollock not only addresses Pen’s fear of coming out to her parents, he also returns to the trauma of her sexual assault and what sort of effect having to keep that secret had on her. I really liked how Pollock handled it and the resolution to this storyline. After having built two equally fascinating but very different worlds in the first two books with Beth’s magical London and London-Under-Glass, in Our Lady of the Streets Pollock not only merges those two, but also adds another layer. With Mirror Mater’s return a number of new and destructive phenomena have arisen. She induces Fever streets, Tideways, Blank Streets and pretty much wrecks the city as we know it at will. The presence of this other, magical London is far more invasive than in previous books where the strange and magical was pushed to the fringes of mundane awareness or to a different realm altogether. Yet in this last book it is present front and centre and even the mundane citizens of London – and the rest of the world for that matter – can no longer ignore the other side of London. I loved the illness metaphor for the Mirrored Goddess’ campaign to retake London and how Pollock incorporated this into the plot. As I told the author on Twitter, after I finished the book: "my heart is in a thousand pieces and yet you left me with hope." Our Lady of the Streets is a fantastic conclusion to an extraordinary series. Tom Pollock has proven he’s incredibly talented and I’m really excited to see where he’ll go next, even if I’m sad to be saying goodbye to Beth and Pen. If you haven’t yet read this conclusion to The Skyscraper Throne, what are you waiting for? If you’ve not yet picked up this series, I highly recommend that you do. It’s one of my favourite series of the last few years and one you shouldn’t miss. Thank you to Jo Fletcher Books for sending me a review copy! So, I’m sad that this series has come to an end, but Tom Pollock is a god, and I will buy everything he ever writes in the future. Because Our Lady of the Streets was an intense and beautiful end to the trilogy, taking all the threads from the previous two books and weaving them together in surprising ways to give them new meaning and emotional impact. Plus, this series has the best portrayal of a female friendship I’ve ever seen. And the best female character. Pen is, for me, the eternal star of this series. In the first book, Beth was definitely the main character, and though Pen didn’t get that much screen time (or page time), it was already clear to me that Pen was my favourite–which was why I was so delighted when the second book had Pen as its main character. This third book, I’m happy to report, has equal amounts of Beth and Pen, and their friendship was at the very core of the story. It was amazing. I love that so much. I honestly don’t know if I’ve ever read a book where it really felt like the friendship between two female characters was honestly the central relationship and so integral to everything that goes on in the story as well. Beth and Pen are best friends, and that matters a great deal. They care deeply about each other. Even as all this war and destruction and death is happening around them, I love that Pollock always took the time to show them supporting each other and having emotional conversations that need to be had. It’s something I feel like I rarely see in other books featuring so much fighting and death. Just two best friends, talking to each other and challenging each other and being there for each other, constantly. Pushing each other to do the things that need to be done. Most of the most moving and breathtaking moments in the book are Pen’s moments, though I’m possibly very biased. Her arc is absolutely mindblowingly incredible. I know I said pretty much the same thing about the second book in the series, but seriously. Pen faces her deepest fears in this book. She goes back to everything that’s ever hurt her and she confronts her own feelings of anger and terror and helplessness, and she is so, so powerful. When I think ‘strong female character’, I think Pen. Her vulnerability, her trauma, the many awful ways she has been hurt, and the way she takes this horrifying past and stares it down and says to it, “no, I own you now”, even as she’s trembling all the while, because the fear is never going to quite leave her. Because she’s real and human and she loves her best friend and the world needs saving and she chooses the danger, she chooses the fear, so that she can stand by her best friend’s side and fight. I honestly think Pen might now be my favourite female character ever. The romance in this book takes a backseat, but what’s there is really interesting. I really appreciated the fact that Beth and Pen’s friendship really was the primary relationship in this book, but I guess it might have been nice to see fuller development on the romance front. Beth and Filius’ story played out in a very unexpected way that was more bitter than sweet throughout most of the book, whereas Pen and Espel’s relationship had the luxury of being a little more straightforward and they were really quite adorable. The ending is wonderful and so smart and I seriously admire Pollock so much for writing it. I’ve always felt that this series was one of the cleverest things I’ve ever read. And at the end it all falls into place and it all makes sense and it’s so thrilling and touching at the same time. All the relationships in this book, the familial ones and the romantic ones and that friendship between Beth and Pen, they’re all there, their meanings in Beth and Pen’s lives interwoven into an astonishing web of emotion that gives both characters the perfect ending for what they are and what they have become over the course of the series. This is the last book of the Skyscraper Throne trilogy and with every last book in a series I go in with heaps of questions. Will I like the ending the author has come up with? Will it be a happy ending, sad, satisfying, disappointing? I’m always excited and anxious to find out, especially if it’s the end to a series I really liked, like this one. We've been on quite a journey with Beth and Pen, seen so many magnificent and unimaginable things through their eyes and we've learned so much along th This is the last book of the Skyscraper Throne trilogy and with every last book in a series I go in with heaps of questions. Will I like the ending the author has come up with? Will it be a happy ending, sad, satisfying, disappointing? I’m always excited and anxious to find out, especially if it’s the end to a series I really liked, like this one. We've been on quite a journey with Beth and Pen, seen so many magnificent and unimaginable things through their eyes and we've learned so much along the way, about friendship, about equality and about the fact that appearance isn’t important at all. With Our Lady of the Streets I honestly couldn't have wished for a more perfect end to this trilogy. Pollock has packed his last book in the trilogy full of action, new aspects of his imaginative London and gut-wrenching emotions. I was glad to see many of the interesting characters we met in the previous two books making an appearance in this one, though there might be a few surprises when it becomes clear who’s siding with who. Mater Viae’s mirror sister has broken free from London-Under-Glass and has placed herself on the throne in London. This obviously hasn’t gone by unnoticed. The city is sick, and with the city so is Beth. I was fascinated by how Pollock transformed this sickness to the city. Fever streets that reach scorching temperatures, the earth beneath the city moving, wrecking most of the buildings, whole areas flooded with molten stone. Sewermanders are serving as Mater Viae’s attack force and even more terrifying creatures hunt the people of the city. Everyone looks up to Beth as their leader, as the one who will make this all go away, but she doesn’t see it that way. She feels weak and doesn’t know what to do to help. More so than in the previous books, the people of London are very aware of everything extraordinary happening in their city (how can they not?) and they are just as much victims of Mater Viae’s reign as the city creatures. The pacing is yet again spot on, never is there a dull moment. There are always new aspects waiting to challenge Beth and her friends, or another crazy idea to try and overthrow Mirror Mater. You won’t be bored, not even for a second, and it will be damned hard to put down the book once you’ve started it. As in the previous books, the writing is strong. Over the three books in this trilogy there has been this same quality of writing, which is what makes this such an amazing series of book. The books are all on par with each other, not one is a disappointment when compared to the others, and they all are a very strong addition to the story as a whole. The one aspect that delivers again and again in the Skyscraper Throne trilogy is the character of Pen. She's one of the main reasons I absolutely adored The Glass Republic and she's just as great in this book. Pen tops my list of favourite characters and leaves her competition way behind. It's so easy to love her, to care for her and everything she's been through. Her character has grown immensely and she has become such a strong woman. I didn’t exactly click with Beth in the first book, but I felt more connected to her character in this book. Beth is really struggling. She’s sick, but she feels it’s her responsibility to do something about Mater Viae’s reign of terror, because of her transformation. The decisions she makes and the way she deals with the consequences are admirable and brave. It shows how much Beth has grown as well since the first book. The ending was both beautiful and heart-rending. I would never have expected an ending like this, but it was perfect. It leaves the reader with a feeling of sadness, but also hope and the feeling that this was the right thing to happen. The Skyscraper Throne trilogy is one of the best Urban Fantasy series that’s out there, with a fascinating take on London and strong characters that will make you fall in love with the story right away. If you haven’t picked up ‘The City’s Son’ yet, I would definitely recommend you do. You’re in for an amazing ride through a London that will look familiar, but is full of unexpected, wonderful new things to discover. So here we are at the finale then and thank HEAVENS it doesnt suffer from what I like to call “lost the plot scenario” which sometimes happens (with one VERY well known trilogy for sure) where the writer seems to lose energy and have no real idea what they intended in the first place. Not in this case, I found it to be a highly satisfying end, although I am still a little sad that it is all over. Tom Pollock weaves his magic once again, pulling together the various strands and offshoots that have So here we are at the finale then and thank HEAVENS it doesnt suffer from what I like to call “lost the plot scenario” which sometimes happens (with one VERY well known trilogy for sure) where the writer seems to lose energy and have no real idea what they intended in the first place. Not in this case, I found it to be a highly satisfying end, although I am still a little sad that it is all over. Tom Pollock weaves his magic once again, pulling together the various strands and offshoots that have appeared over the course of the story and setting up a thrilling and really quite haunting final confrontation in the style we have come to expect, by using stunning descriptive prose then letting his characters speak. As the streets shatter and the world tilts on its axis, Pen and Beth are right at the heart of it all, fighting for survival and to make London safe again. An age old tale in a way – a true battle between good and evil – this is a fresh new take on the Urban Fantasy genre and one that will stay with me for a long time. Beth and Pen, like old friends who have moved away, will be missed as will the rich, imaginative environments they have inhabited. Whilst the story IS complete there is so much depth and emotion to this world that it feels like there are many more stories to be told – one might hope that the author will revisit it one day, perhaps with a new inhabitant or a new hidden layer. Stories such as those Tom P There was always something special about Beth Bradley; something which went beyond her quick wit, her evident intelligence. Wasn't so long ago she was one among many—a badly-behaved teenager suffering through school, as exceptional individuals like Beth tend to—yet even then she was set apart by her street art; by graffiti which came to life because of her partnership with Pen, who'd append poetry to her pictures, turning still images into stories. Stories of the city. How can I sum up this book? An amazing conclusion to an amazing series. I have loved every page of 'The Skyscraper Throne' from beginning to end, and 'Our Lady of the Streets' is a worthy end to the series. Tom Pollock handles a winning blend of distinctive, sympathetic characters with an intriguing setting that gripped me from start to finish. Which is annoying, because it's now past two o clock in the morning, and I could really do with some sleep. The book isn't perfect (view spoiler)[The way de How can I sum up this book? An amazing conclusion to an amazing series. Didn't post any reviews for the first two books in this trilogy and it ended on a good note this trilogy would be best described as a urban fantasy based in a modern day London and well our characters are Pen and Beth I won't spoil anything but yeah I enjoyed these books and it just adds to London's mystery and kudos to Tom Pollock for writing these books as I was itching to learn what would happen to Pen and Beth in each book as the trilogy went on and you what the wait was worth it. Considerin Didn't post any reviews for the first two books in this trilogy and it ended on a good note this trilogy would be best described as a urban fantasy based in a modern day London and well our characters are Pen and Beth I won't spoil anything but yeah I enjoyed these books and it just adds to London's mystery and kudos to Tom Pollock for writing these books as I was itching to learn what would happen to Pen and Beth in each book as the trilogy went on and you what the wait was worth it. Considering the fact that picked up the first book because it sounded interesting I had no idea that I would be swept away with the concept but I was. The Glass Republic raised the stakes and threw in enormous character development. Our Lady of the Streets, against the odds, managed to raise the inventive ideas again, gave heroes that were imperfect and didn't necessarily have the highly noble motivations that are so very common in fantasy. It also put me through the emotional wringer. I love it when a book does that! I don't like to leave a book unfinished but unfortunately I just couldn't get into this one. I struggled with the whole series and it's left me a bit sad and unsatisfied. The world is fantastic but the story-line left me wanting and I really did not like the characters. I feel like this series is either all or nothing - so either nothing is happening or a lot is and you can't keep up. The first few pages of this book just got to be a bit too much for me I'm afraid. As a series this has been as imaginative a YA series as i've come across. The detail created throughout all the books has simply been stunning. The creatures and city produced is realised so well its impossible not to get drawn in. The characters themselves have been fantastic , Pen becoming my personal favourite. Tom Pollock has skillfully written both male an female teenage leads without any awkwardness . While each if the three books stands out in their own unique way, each altering its approa As a series this has been as imaginative a YA series as i've come across. The detail created throughout all the books has simply been stunning. The creatures and city produced is realised so well its impossible not to get drawn in. The characters themselves have been fantastic , Pen becoming my personal favourite. Tom Pollock has skillfully written both male an female teenage leads without any awkwardness . While each if the three books stands out in their own unique way, each altering its approach , the finale has carried it all brilliantly to its end. Book one of the series was rather conventional, book two took a left field turn and raised a victim, a surviver, into the hero of her own story. With book three, the finale, all of what came before crashes together. It is hard these days to read a book and not know what happens next. Kudos to Mr Pollock for surprising me to the very end. That was a really great ending to the series, which managed the unusual trick of being a trilogy where each book stands as a novel in its own right, not just a super long book split up into three parts. Any review will inevitably spoil something from the first books -- or this one. Instead I'll tell everyone to pick up The City's Son. Much more back to the form of the first book, very enjoyable. I felt the big finale was perhaps a little too close to the end; I began to wonder if I would run out of pages before the crisis was resolved! But everything was rounded off well, with just a touch of 'make up your own mind' at the end, not too many neat little ribbons to tie all the ends. I was pleased to have won this book in the Goodreads Giveaway a couple of month's ago. Perhaps because I hadn't read the first two books, it did take me a while to get into the story. Enjoyed and will at some stage, read the first two books. I thought this fizzled out a bit at the end, but otherwise, it was very good. A surreal, dreamlike ending to a unique, young adult, urban fantasy. Tom Pollock is going to be a force to be reckoned with.